Well, I’ve been really busy lately. Since Greg broke his hand, that means he can’t drive. Therefore: anywhere he needs to go, I drive. Needless to say, we’ve been out of the house a lot over the past two weeks. I’d like to apologize to the great number of people waiting for replies from me. However, I have done a bit of knitting (in the car. While waiting, not driving). Since we’ll be moving soon (to Japan), in the winter, to a place where it actually snows (Japan) I thought it would be fun to start making cold-weather gear for the family. You know. For snow (in Japan!). I started with Charlie, as he’s the smallest. Mittens! How cute is that? Little, bitty, stripy mittens. 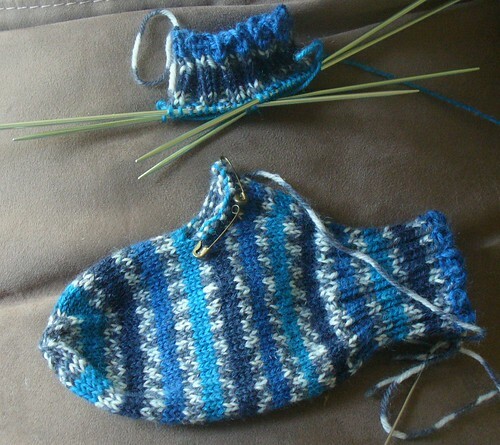 I cast on for the second one instead of finishing the thumb on the first because I was at the perfect spot in the color repeat to have matching stripes on both of them. Pretty sweet, huh? I’m using Ann Budd’s basic mitten ‘recipe;’ in Lion Brand Magic Stripes on size 1s. Max is due for a similar set, and I’ve ordered some yarn to make each of them a sweater. Lemme tell you, this is gonna be fun. Those are so adorable! How cool that you get to live where it is cold enough to actually wear your handknits for quite some time. I need to get out of the desert.